As your lawn care specialist, it’s our goal to provide landscaping and lawn care services to help keep your lawn beautiful and healthy. Each season brings its own challenges and we are equipped to handle them all: whether your lawn requires mowing, fertilization, aeration, seeding, weed/pesticide control, or a simple cleanup, you can count on us. By combining science and art to create landscape design masterpieces, our experts install scenes that are the envy of the neighborhood. We are passionate about what we do and approach each and every landscaping project with creativity and enthusiasm. We take pride in delivering results that exceed our customer's expectations. Ritter Grounds Maintenance, Inc. in Norfolk, Virginia, is a locally-owned, full service, commercial and residential lawn maintenance landscaping service. We have been serving the Hampton Roads area since 1990 and have more than two decades of experience. We’re here to help your commercial or residential property look great. Interested in our Landscape Design or Lawn Care Services? We offer free evaluations and estimates! Click the "Request Quote" button for your free estimate. Since the very beginning, Ritter Grounds has had a commitment to creating outdoor spaces that enrich the lives and prospects of our clients and the communities in which they live. Whether you’re a commercial client hoping to make that great first impression on customers or a residential client in need of an at-home getaway, we give your property the level of service it deserves. For over 20 years, we have provided a range of services, from landscape design, architecture and installation to full-service lawn care and maintenance, to the Norfolk, Virginia Beach, and Hampton Roads area. Helping our customers understand and be successful with all of their landscaping dreams and ideas is what separates our family-run company from the “Big Box” competitors; we’re here to listen to what you want and provide you with creative and affordable solutions to meet your individual needs while educating you on the secrets of the industry to help keep your landscaping investments successful. 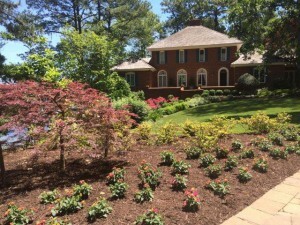 We are viewed as one of the best landscape contractors in the area. Take a look at our landscape design or lawn care maintenance services here in Norfolk, Virginia Beach, and Hampton Roads, Virginia! Copyright © 2014 - Ritter Grounds Maintenance, Inc.